Praise God! Dr. Richard was able to take a couple of days away for prayerful planning. Thank God for progress made toward translating RREACH’s evangelistic and pastoral training products into Spanish, French, Hindi, Arabic and other languages. Glory to God! Several visas in a row have been granted to 2019 Dallas Global Proclamation Academy candidates. Pray for Dr. Richard’s upcoming filming of Scripture Sculpture and the postponement of a trip to Haiti. Dr. Richard is thankful he was able to get away for a couple of precious days of intensive and prayerful planning. Please pray for more opportunities like this in the coming months, which appear quite full. Pray that Dr. Richard will be able to maximize those times. God is granting good progress toward getting quality translations of LifeRocks, Dr. Richard’s media-based evangelistic outreach, and of some of his pastoral training materials. Pray for accuracy and capacity for more languages. Pray, too, for reasonable pricing. A huge praise: Seven 2019 Dallas GPA candidates’ visa applications in a row have been approved! To date, 12 pastors plan to come, six from un- or under-represented countries. Pastors from Ghana, Cambodia and Solomon Islands have upcoming appointments. Many others are working on their applications and scheduling appointments. Thank you for praying and please continue. 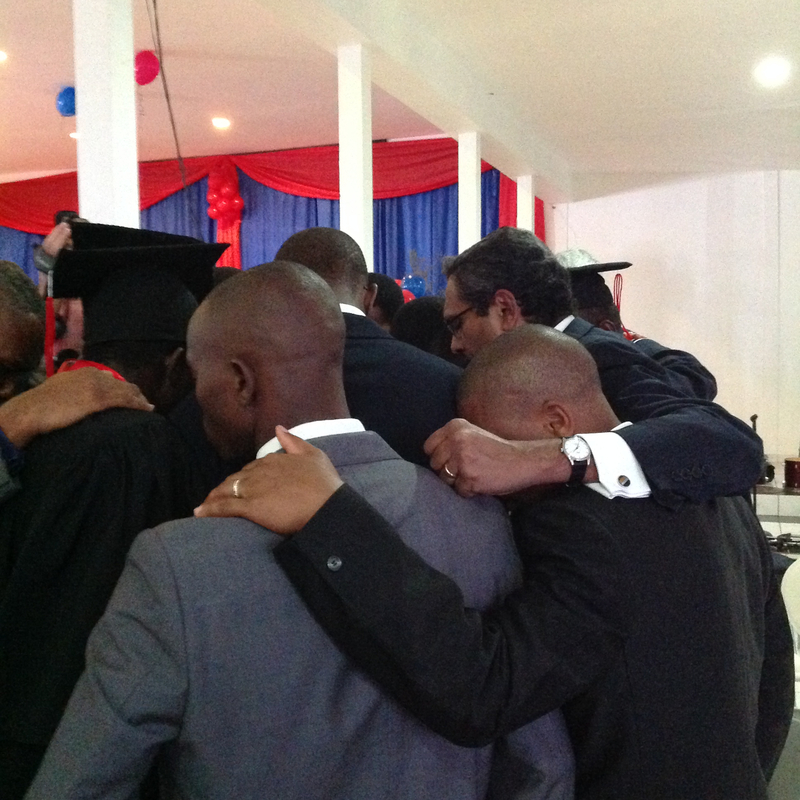 Also pray for GPA Madagascar, set to begin this week. Ask for God’s hand to be on organizers as they finish preparations and for the right 25 attendees. 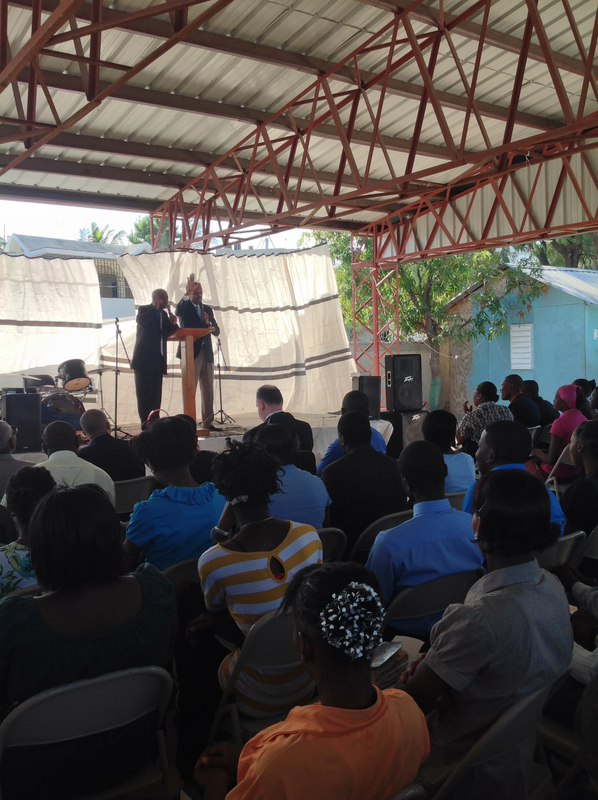 Dr. Richard was scheduled to minister in Haiti later this week. However, because of the volatile situation there, the events are being postponed. Please intercede for Haiti and for the many other areas around the world in turmoil. Pray for God’s intervention—for safety, provisions, resolution of conflict, and especially for pastors and their families as they minister in those areas. Please also lift up Dr. Richard’s Scripture Sculpture recording sessions this week. Be all in. Go all out. We’re thanking God for sustaining Dr. Richard through several demanding weeks. Please pray for a special RREACH vision event coming March 1–2. Ask the Lord for Dallas Global Proclamation Academy nominations from unrepresented countries and visas for all accepted candidates. Uphold Dr. Richard’s preparation for ministry trip to Haiti in late February. Dr. Richard challenged Dallas Seminary chapel attendees to pursue the “NIV Life” (Not In Vain), to “be all in” and “go all out” for the Lord Jesus. Your ongoing prayers for Dr. Richard mean so much, even when you might not know specifically what he has going on. For instance, he recently returned from a demanding ministry trip to immediately prepare for and host two major board meetings (one taking place this weekend), teach a full day at Dallas Seminary, and speak in the seminary’s chapel service—all while keeping other ministry concerns rolling along. He is grateful for God’s sustaining presence and power and for our prayers. One of the “other ministry concerns” Dr. Richard has in progress is a RREACH vision event set for early March. Please pray for the right attendees and excellence in all the details of preparation. Pray, too, for opportunities for him to set aside time to write and for wisdom regarding various leadership projects. Please intercede for the Dallas GPA nomination and candidate selection process. We have accepted 20 candidates, but need more from countries not previously represented. Also intercede for the accepted candidates’ preparation process. Getting visas to come to the U.S. remains a critical challenge. Several pastors have already been rejected. Nine have upcoming visa appointments. The pastors and embassy officers need to be covered in prayer. The Lord willing, Dr. Richard will minister in Haiti later this month, encouraging pastoral leaders and speaking to opinion leaders, including government leaders. Please uphold the organizers and organization of these events. Pray that Dr. Richard will proclaim God’s Word in a mighty way. Ramesh Richard has two memorial services for his dad in India this weekend. The latest Dallas Global Proclamation Academy candidates applying for visas were rejected. GPA Zambia wraps up this week; GPA El Salvador is coming. The GProCommission team is sourcing pastoral training content for updates and blogs. Dr. Richard is to participate in memorial services for his dad this weekend in Delhi and Chennai, India. Please continue to intercede for the Richard family. Also intercede that many will embrace the Good News proclaimed at these services. Two Dallas GPA candidates were denied visas this week. Strong prayer is still needed on every applicant’s behalf. Pastors scheduled for interviews next week include M – Haiti, J – Vanuatu, S – Gabon, and M – Burkina Faso. We’re also beginning to search for airline tickets. Please pray for good itineraries at the best possible prices. Zambian pastors studying how to preach an expository sermon. The second national GPA held in Zambia finishes this week. Thank God for the 28 young pastoral delegates and ask Him to further connect, unite and strengthen them as they get back into the daily demands of ministry and life. GPA El Salvador is coming March 18. We pray for God’s Word to be proclaimed more and better in every reach of the globe as a result of national GPAs. The GProCommission team is always on the lookout for high quality, engaging pastoral training material that is applicable across many cultures and contexts. Pray that God will alert us to such resources. 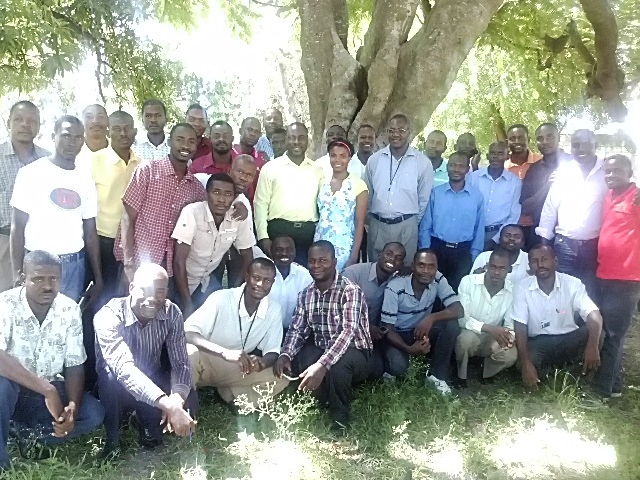 Pray, too, for more pastoral trainers to become connected, united and strengthened through our efforts. I want to thank you again for your investment in our life during Dallas GPA 2015. I had 5 days of teaching last week. 35 pastors attended the class. Some of them came very far and in difficult area to attend the training. We ate, worshiped and shared experiences. The experience of GPA 2015 was very helpful for this week of teaching. Give thanks for this good report and lift up all 26 graduates from the 2015 Dallas GPA as they faithfully proclaim the Lord Jesus Christ and pass what they have learned to other pastors and leaders in their nations. Every fifth year, Dallas GPA grads get together for a strategic reunion. The Lord willing, many will attend the 2016 Global Proclamation Congress for Pastoral Trainers where we will meet instead of hosting a Dallas GPA. Because an event of this scale has never before been held for people involved in training pastors, especially in bringing them together from non-formal and formal sectors, getting the word out is crucial. Please ask God to specifically guide and greatly bless mobilization efforts. Thank you. 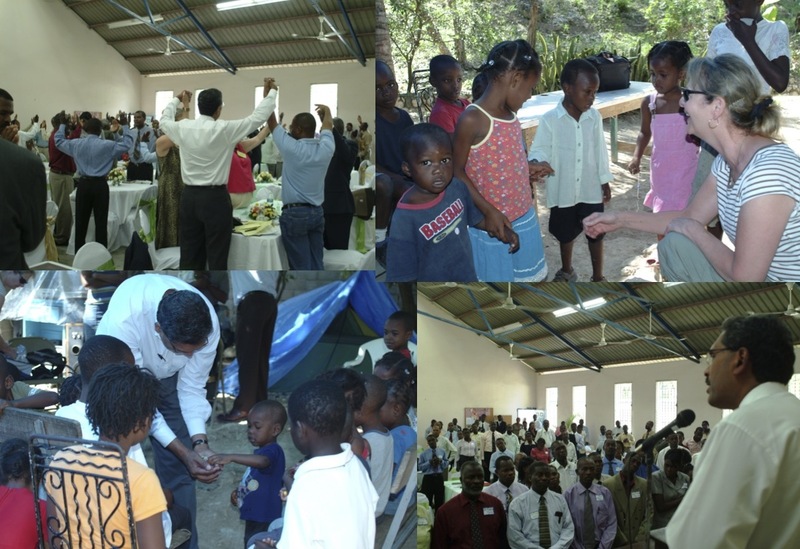 Thank you for praying for Dr. Richard during his trip to Haiti. He and the team have returned safely and we are excited to bring you a trip report, along with a Christmas greeting sent from Haiti to RREACH friends via email. If you would like to join RREACH’s mailing list, please email me at edie@rreach.org. The joy of this trip centered upon the multiplication of RREACH training by Dallas GPA graduates to the third and fourth generations. The team was met at the airport by Pastor V (2009 Dallas GPA graduate). They spent time their first evening in Haiti with Pastor B, a 2005 Dallas GPA grad who was referred by Pastor E, a Dallas Seminary graduate who has worked in ministry partnerships with Dr. Richard since the early 90s. Prior to coming to the Dallas GPA, Pastor B was already training pastors. But since receiving training on how to create and preach expository sermons, he has multiplied his training and has taught Dr. Richard’s Scripture Sculpture method to 560 pastors each year. Scripture Sculpture also is taught in the local seminary and was used to craft a written sermon that has circulated through the country. It is estimated that this sermon has caused more than 100,000 people to make decisions toward Christ. The next morning Dr. Richard delivered the keynote address at the seminary’s commencement. Fifty-two would graduate, many at great personal expense. Some pastors traveled back and forth for up to seven hours on extremely difficult roads to attend the two-year training. All were bivocational, meaning they would work a regular job, pastor a church and also devote time for the two-year course. The seminary was the vision of Pastor V, and so again, the team was blessed to see how RREACH training was being multiplied. That evening, Dr. Richard spoke at an evangelistic event attended by 90 people including congressmen, senators, doctors, lawyers, college professors and entrepreneurs. He spoke about passion, mission and vision and challenged the audience to consider how this plays out in their personal and professional lives. He asked them to think about how they could make a difference, encouraging them to make God the passion of their lives. We’ve heard that more than 20 people made decisions to trust Christ that evening! Sunday began bright and early as the team left the hotel at 5:30 a.m. to attend a 6 a.m. service at the oldest church in Haiti, which was packed full of 1,200 people. Next, they stopped at Pastor V’s outdoor church — a young congregation. Dr. Richard addressed the congregation and Pastor V interpreted. 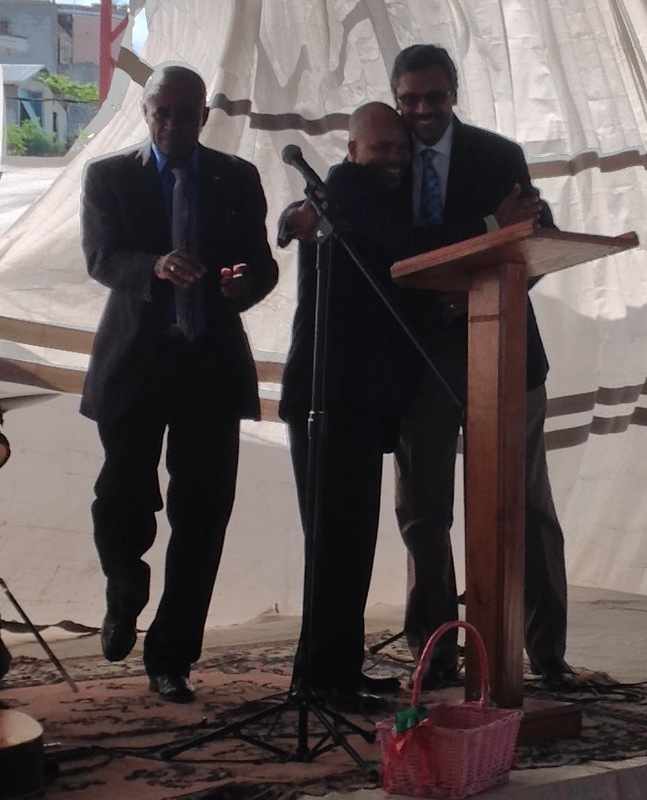 Next, the team traveled to Pastor E’s church where Dr. Richard spoke during two services. That evening the team had the opportunity to meet up with Pastor V, who shared about his ministry and its joys and challenges. He is responsible for 17 churches and his vision is to not only train pastors, but also to help provide healthcare and life insurance – especially for older pastors – to assist with medical needs and funeral services. Please continue to pray for the pastors in Haiti, which is still dealing with the devastation caused by the 2010 earthquake. (Pastor V still sleeps outdoors while his home is completed!) Pray specifically for pastors E, B and V that God would continue to use them mightily to bring the Haiti people to Himself. Please join with us in prayer today and over the weekend as Dr. Richard and a few RREACH staff and friends travel to Haiti to minister there. Dr. Richard and RREACH have a deep history in this country that is impoverished materially but blessed with giants of the Faith. Dr. Richard has made several trips there to train and encourage pastors, including in 2010, just a month after the devastating earthquake that claimed the lives of 300,000 people. He and the RREACH team traveling with him, including Dr. Richard’s wife, Bonnie, went to provide a day of refreshment for Haitian pastors dealing with their own losses of loved ones and physical property while also trying to minister to their hurting congregations. Dr. Richard said this of his decision to go then. Bonnie and I were there … because the pastors had stopped smiling and singing. Saturday: In the morning, Dr. Richard will deliver the keynote address for the Theological Education Program commencement ceremony. Pray that those attending the commencement ceremony would be transformed and encouraged by Dr. Richard’s message. That evening he will speak to “hope-less” opinion leaders at an evangelistic dinner. The office of Haitian president Michel Martelly called to inform RREACH’s Haitian hosts of Martelly’s sudden need to go to the funeral of Nelson Mandela, which will cause him to be unable to attend the evangelistic event Saturday evening. Please pray that many opinion leaders would attend, and that many would find hope and place their trust in the Lord Jesus Christ. Sunday: Dr. Richard will teach from the pulpit during two services at Eglise Baptiste Berée, the church of long-time RREACH friend Pastor E, a Dallas Seminary graduate. That evening Dr. Richard will have a special visit with GPA graduates in the area, who have multiplied their training to the third generation. Dallas GPA graduates from Haiti in 2011 put on GPA Haiti. GPA Haiti graduates, in turn, were inspired to organize intentional pastoral training for 100 specially selected pastors from all 10 regions of Haiti. Please pray that God would use Dr. Richard’s preaching at Eglise Baptiste Berée to impact those attending and that the special visit would be of mutual encouragement and refreshment for GPA graduates and for Dr. Richard.